Remember searching through your school yearbook for pictures of you and your friends? Well, that could be a thing of the past. A California based company is taking advantage of digital technology to personalize yearbooks. It's all thanks to a new service called TreeRing. "We use this latest digital printing. So, for TreeRing, we're basically disrupting this multi-billion dollar industry that's been around for a long time with innovation that ends up being better for the student and better for the school," said Aaron Greco, the Co-founder of TreeRing. TreeRing is different from a traditional yearbook, in that, you're doing it all online, which makes it a lot easier to share pages with other people that are working on the yearbook with you. You also have the ability to customize the yearbook for your child. 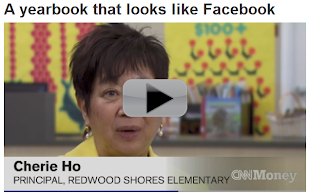 "Our family, what we decided to do, was instead of ordering three different yearbooks, we decided to make a custom page for each of our children so that we could have all three in here, and we added a fourth page with all three of them together so that they could share the yearbook," said Sue Kim-Ahn, a parent. In recent years, a number of schools in California have cancelled yearbooks because of cost. Now because of TreeRing they're saving a lot of money. Parents can deal directly with the vendor themselves, and buy the yearbook from the site, only if they want to. TreeRing also plants a tree for every book they print.